Wild Reishi mushroom benefits your Shen more than any other herbal adaptogen. It is said that wild Reishi mushroom benefits your spirituality more than any other herb or substance known. In addition to that, it is also known that Reishi mushroom benefits your immune system more than any other herbal adaptogen on the planet (with the exception of other similar medicinal mushroom species). Through the millennia it has been seen as the single most important herb for Chinese longevity. Chinese herbalism nicknamed the Ganoderma mushroom "the mushroom of immortality" because of the rumoured mystical powers that it granted to those who consumed it. Among the "superior class" (the top of three classes) of herbal adaptogens in Chinese herbalism, the Linzhi (a.k.a. 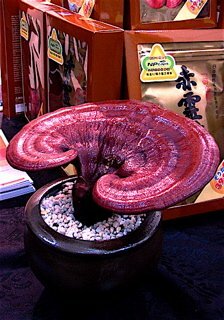 Reishi in Japanese a.k.a. Ganoderma Lucidum in Latin) mushroom ranks at the number one position. Reishi supplements all 3 treasures (Jing, Chi and Shen) but has the most tonic action on Shen (spiritual radiance). Many Chinese herbalists recognize that wild Reishi mushroom benefits Shen more than any other herbal adaptogen known. The Ganoderma mushroom is a Chinese symbol for longevity. It is often compared to the lotus flower from the Buddhist traditions in terms of its significance as a spiritual symbol. For the Chinese, longevity was inseparable from spirituality and those who pursued life-span development were also seen as spiritually "advanced". The two pursuits definitely go hand in hand since the longer you live, the more time you have to meditate, pray and do other spiritually advancing practices! Although it is tonic to the whole body, red (the most commonly cultivated and most medicinally active) Reishi mushroom benefits the Liver and Heart organs foremost. Chinese medicine capitalizes certain organs since they are seen as a group of two or more organs that work in tandem (for further information, google TCM organ systems!). 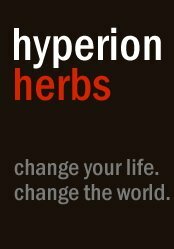 Hyperion Herbs offers an 10:1 concentrated powder extract (10x more potent than the whole herb) which can be mixed directly into smoothies, elixirs, other drinks and/or mixed into food! Just scroll down the screen until you see the 45 gram package of reishi mushroom extract. 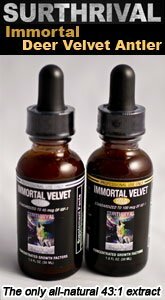 Surthrival offers dual extraction reishi and chaga tinctures. Dual extraction means that both the oil soluble (extracted with organic alcohol) and water soluble (extracted with spring water) constituents are extracted separately and then mixed together and stored in violet miron glass. From the scientific properties listed below,it is clear that the Chinese classification that Reishi mushroom benefits the whole body is accurate. It's heart and liver actions are listed below along with its immunomodulating (the Lung organ system), spleen and stomach protecting (the Spleen organ system) and adrenocorticol improving (the Kidney organ system) qualities. This demonstrates that traditional herb information is often quite accurate despite the difference in methods of study between older herbal systems and modern science. The benefits of Reishi mushrooms are as follows: analgesic, anti-allergic, bronchitis (preventative and regenerative), anti-inflammatory, antibacterial (Staphylococci, Streptococci and Bacillus Pneumoniae), antioxidant (again hydroxyl free radicals), antitumor, antiviral, lowers blood pressure, bone marrow nucleated cell proliferation enhancement, cardiotonic, central depressant and anticholinergic (relaxes muscles and reduces the effects of caffeine), natural killer cell enhancement, expectorant and antitussive, immunomodulatory, anti-HIV, adrenocortico function enhancement, interleukin 1 and 2 production increased, liver protective and detoxifying, prevents B monoamine oxidase effects, ionizing radiation protection, anti-ulcer, white blood cell and hematoglobin in peripheral blood increased. Spleen (spleen, stomach and pancreas): The polysaccharides in Reishi mushroom benefits the spleen by increasing DNA synthesis in its cells. It has been found that the Ganoderans A and B, glycans of the fruiting body of the Ganoderma mushroom are able to significantly reduce blood plasma sugar levels in hyperglycemic mice (pre-diabetic) which helps take some burden off of the pancreas. One human study found it effective in treating duodenal ulcers (stomach). Lung (lung and large intestine): In mice Reishi mushroom benefits the lungs as an expectorant by helping clear them of mucus. In the 1970's over 2000 patients with chronic bronchitis and bronchial asthma were part of clinical studies in China. They found that after 2 weeks on Reishi supplements, 60-90% of patients had a marked improvement, many even having an increase in appetite. The immune system is seen as seated in the Lung organ system according to TCM. The benefits of Reishi mushrooms are most apparent with its immunomdulating effects. This means that if the immune system is under reacting, the Ganoderma mushroom will boost immunity and if it's over reacting, it will calm it down! Beta-D-glucan, a type of polysaccharide, appears to be the main contributor to this valuable effect. Kidney (kidneys, bladder, genes, adrenals and endocrine system): In vivo and in vitro studies have shown that Ganoderma Lucidum extracts improves adrenocortical function (the adrenals are responsible for many of the important hormones of youth as well as regulating body temperature). The various sterols found in Reishi mushroom benefits the endocrine system by acting as hormone precursors. One study showed that taking reishi supplements before and after exposure to ionizing radiation helped prevent and minimize the negative effects of the radiation. This naturally helps protect the DNA from becoming damaged and causing accelerated aging. Liver (liver and gallbladder): The benefits of Reishi mushroom on the liver are demonstrated with the favorable results attained with its use in cases of hepatitis (especially before severe impairment of liver function has occurred). One study of 355 patients with hepatitis B who were treated with reishi supplements (which contained other herbal adaptogens as well) showed that 92.4% of the patients had positive results! The compounds in Lingzhi that cause these benefits for the liver are quite likely Ganodosterone (a plant steroid) and Triterpenes R and S. These antihepatotoxic compounds protect and detoxify the liver and are some of the best health benefits of Reishi mushrooms. Heart (heart and small intestine): It has been shown that Reishi mushroom benefits patients with coronary heart disease and hyperlipidemia, resulting in varying degrees of improvement in symptoms. One controlled study showed a Ganoderma extract being capable of reducing blood and plasma viscosity in hypertensive patients with hyperlipidemia. Yet another study showed the Ganoderma Lucidum extract was capable of lowering blood pressure and reducing cholesterol. Also, Reishi mushroom benefits those in high altitudes (such as mountain climbers) as it increases oxygenation of the blood (both an effect on the Heart system as well as the Lungs for TCM). Here are some things to keep in mind when seeking the benefits of Reishi mushrooms for your health and longevity. The quality and benefits of medicinal mushrooms like Reishi come into question when they are cultivated, but can also be better quality then low quality wild specimens when cultivated properly. You have to be absolutely certain that the reishi supplements are in the form of organic tinctures, organic supplements or the organic raw herb. Mushrooms have a tremendous ability to act as sponges and unfortunately lock up pesticides, fungicides, etc in their tissues. A good quality, certified organic product will give you good quality results your body deserves! If you're looking specifically for the well known wild Reishi mushroom benefits, then make sure it is deep forest Reishi and not a specimen that has been growing beside a highway absorbing all the toxins the tree has been filtering out of the air. The Ganoderma mushroom is completely non-toxic (if it has been grown in a healthy environment) and the only known negative side effects reported have been from people who had allergies to mushrooms. This makes Reishi a true herbal adaptogen. It can be taken every day for the rest of your life... this might be a pretty good idea! If you have allergies to anything (including mushrooms) it might be worth experimenting with the benefits of Reishi mushrooms. It has many anti-histamine type compounds in it and has been used clinically for the purpose of helping people eliminate their body's autoimmune response to their allergies. If your allergy is specifically to mushrooms then it would be best to experiment with Reishi under the care of a knowledgeable health care professional and increase your dosage very slowly. Reishi mushroom benefits virtually everyone who tries it, if it's from a high quality source. It's calming and spiritually expanding qualities have been discussed for many millennia. The commonly accepted theory about all mushrooms is that they are an extra terrestrial species. Spores (microscopic mushroom seeds) are easily carried on the wind and "become lighter than air" with the slightest gust of a breeze. 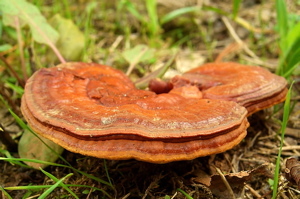 Click to return from "Reishi Mushroom Benefits" to the "Adaptogenic Herbs" page.